Pura Taman Ayun was built in 1634 by the Raja of Mengwi, I Gusti Agung Putu. It is a socalled Pura Kawiten or family temple, a special temple where the deified ancestors of the Raja Dynasty of Mengwi and important gods of other temples are honored. a small forest with the width about 6 – 7 hectares located in the middle of the rice fields in Tabanan regency, west part of Bali. The size of this forest, temple and its supporter facility are about 12 hectares. In this forest, there is a temple called Alas Kedaton Temple with natural environments with fresh atmosphere. Meanwhile, the monkeys are tame and free gallivanting in the temple yard. We can find the cute of monkeys jumping around. climbing up the trees or temple building. The monkey like as custodian of temple, which are always ready to greet all visitors who visit to this place. In addition, we can also met the bats and some other animals. At least 24 types of grove plant have been identified in Alas Kedaton. 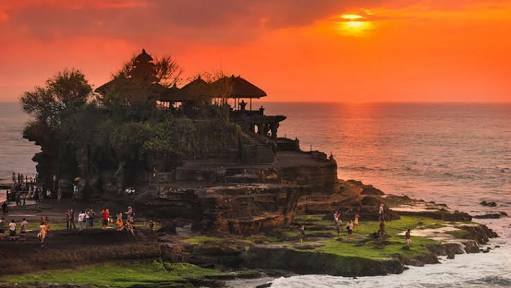 The function of Tanah Lot Temple can be realized from the function of the main temple building which is located in the temple main area. In this place, there is a main temple to worship the god in form of Dewa Baruna or Bhatara Segara, the sea power. The media of worship to this god is the temple building with 5 storied meanwhile the 3 storied temple building.